You can add or remove USB/FireWire audio and MIDI devices while SONAR is running, and the audio and MIDI engines will dynamically respond to any changes. When a device is added or removed, SONAR prompts you to confirm or cancel the change. If you click Yes, playback stops and the audio and MIDI engines reload. Enabled inputs and outputs are persisted per device and per driver mode. This prevents audio ports from shifting around and causing unwanted devices to become selected as active audio inputs and outputs. You can add a device back at any time and SONAR will remember the last set of enabled inputs and outputs for that device. You can freely add or remove devices without impacting the current working set of enabled devices. Adding a device back will remember its last selected inputs and outputs. You can also switch driver modes and the existing enabled devices will be remembered for the next time when you switch back to that mode. When loading a project after changing audio devices, SONAR will attempt to automatically remap any missing device to an equivalent new device. If an equivalent match is not found, the Missing Audio Outputs dialog box appears, allowing you to manually reassign any unresolved output ports. 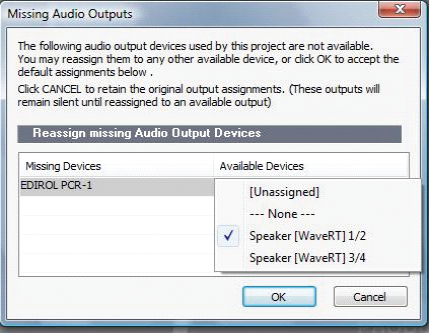 The Missing Audio Outputs dialog box will suggest default assignments for any missing devices. You can click OK to accept the assignments, or click Cancel to preserve the original missing device assignments. You can also preserve the original missing device by selecting [Unassigned] from the Available Devices list. If you choose not to reassign a missing device, the Output port selection in SONAR will show the missing device name prefixed by MISSING. Note: The Missing Audio Outputs dialog box is not shown if there is only a single missing output port and only one available output port. In this case, SONAR will automatically assign the missing output port to the available output port. When Use friendly names to represent audio drivers is selected in Edit > Preferences > Audio - Devices, SONAR can intelligently remap devices across different hardware configurations or driver models by using your assigned friendly driver names, even if the hardware names do not match. This can be very useful if you switch driver modes and load projects you worked on earlier in another driver mode, or if you collaborate with other people who have different hardware configurations. As long as you set up friendly names that match, all outputs will be automatically remapped. Note: Remapping with friendly names takes precedence over the actual hardware device names. Enabling a new output port. All MIDI tracks and control surfaces retain their current output port assignments. Disabling an unassigned output port. All MIDI tracks and control surfaces retain their current output port assignments. MIDI tracks. The Missing MIDI Ports dialog box appears and lets you remap the missing output ports to available output ports. Note: If you do not remap a missing device, the track’s Output control will display MISSING: <name of missing device>. If the missing device becomes available in the future, the track will automatically be assigned to the correct device. Control surfaces. The control surface output port is assigned to None. Figure 36. The Missing MIDI Ports dialog box lets you remap missing output devices. Figure 37. A track’s Output control shows the name of the missing device. MIDI tracks. 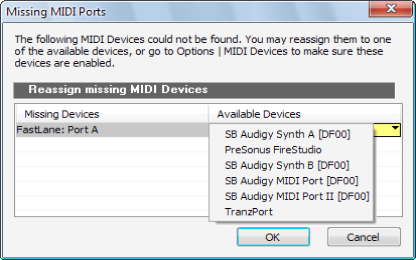 The Missing MIDI Ports dialog box appears and lets you remap the missing devices to available devices. Note: If you do not remap a missing devices, the track’s Output control will display MISSING: <name of missing device>. If the missing device becomes available in the future, the track will automatically be assigned to the correct device. Control surfaces. Control surface output ports are assigned to None. SONAR persists the names of MIDI ports that are assigned to control surfaces. This ensures that the correct MIDI ports are assigned to control surfaces, even if you add or remove other MIDI devices.